We have seen a lot of chain necklaces this season, and from the very best of brands, they are all shades of gorgeous. However, we decided to bring you something different but still with the same appeal. 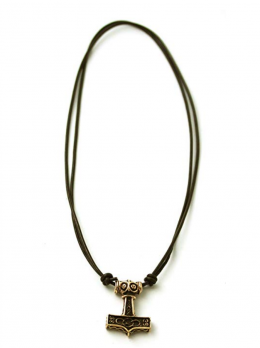 Leather necklaces are great for men with the way they dangle perfectly from the neck. They are one of the top choices for those who want to rock a necklace without having to deals with clasping a chain around their neck. This piece of accessory can come with several gemstones, and even some of the pendant in your favorite gold, silver or diamond chain category can be work with them. That said, it’s time to check out how cool leather necklace looks on just about anyone and then you can choose from the 1 to 10 ranking that we have for you. Jewelry is one of the favorite things that you can possess. Their value and sophisticated outlook make them perfect for your everyday outing. And the necklace is part of this jewelry category. Necklaces are charming with the way they look. They are easily noticed and give off this air of elegance that can be arguably unrivaled by other jewelry. 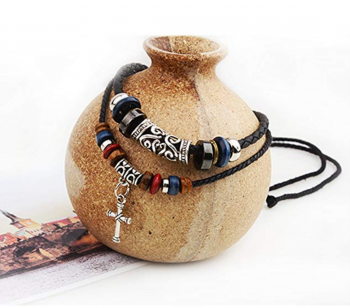 You can also choose from the various category that is available in the market and in one of those categories, is the leather necklace. Leather necklaces are just like their name; they are necklaces that have a leather cord instead of a chain. You can get one in different colors but what is common to all is the thick and lasting texture of the cord. The beauty of the necklace is that they show how beautiful leather can be and you would see that it’s not only our sandals that they can accentuate well. You can also hang a series of pendant form them, whether it’s gold, silver, an heirloom or just something significant to you. You can always use a leather necklace to keep it close to your heart. The products we have for you in this article are from the very best of the men’s category, and we made sure to select ones that would make a bold fashion statement on your neck. But before we look at our ten ranked products, let’s see celebrities who enjoy the exquisite feel of a leather necklace around their neck. Male celebrities are always known to be conscious about what they wear, and they make sure it’s not too girly or feminine in appearance. To that, we found our first piece hanging beautifully from the neck of Johnny Depp, while he stood in all sizzling drama & hotness in front of the camera. Also, we saw famous rapper, Rick Ross, with a Fendi belt no doubt made out of the best leather available on the market. Robert Downey Junior was also spotted with a leather piece of the necklace around his neck. Other than these, there are others we spotted with this category of jewelry. We start first with the best piece in the set. It is carved to look like Thor’s hammer with all its aesthetic added to it. That said, it’s the lightweight and stylish leather cord that sets it apart from the rest. You can trust it positive aura to bring you great experiences, and you would enjoy how durable the hammer is. Check out the review for the jewelry, and you would be amazed by how fantastic it is. 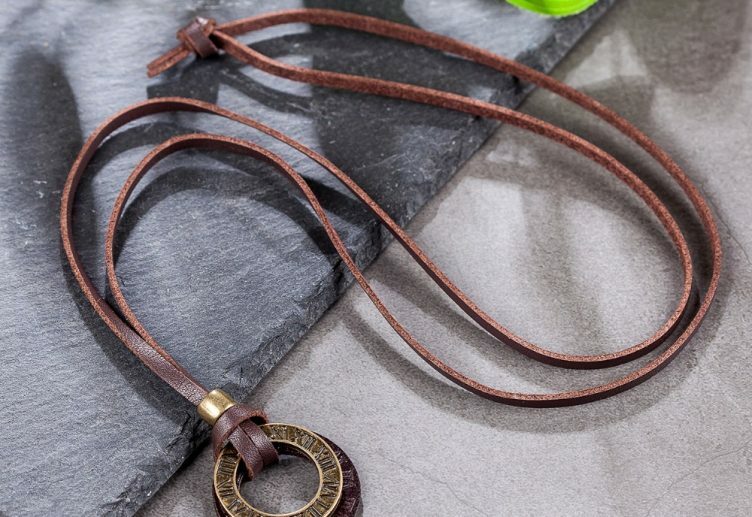 This leather necklace has one thing common to all jewelry that belongs to the same category, and that is a leather cord. Its pendant is made with fancy metal alloy with a terrific design strewn all around it. The dimension of the pendant is 6 millimeters wide and weighs just 80 grams, which would make you feel convenient. You also get a gift bag that makes storage easy and you can get it as a gift for someone special. Other info: the clasp of the necklace is fancy and would help you keep it on your neck securely. Leather necklaces have the advantage of using materials that don’t use lead, cadmium or tarnish. They won’t cause any damage to your skin, and they are fashionable enough to look good on you. This is one piece that you would enjoy for a long time to come, and the quality of the build can only be described as outstanding. From the necklace to the pendant, it’s one gorgeous package in this great offer. Made with hand cast and hand finished materials, the surface of the pendant is done with satin and antique finish. 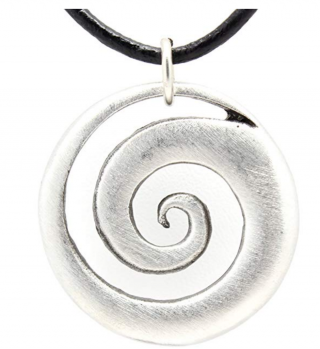 You would love the smooth feel of the shell shape that comes in a spiral Maori style. 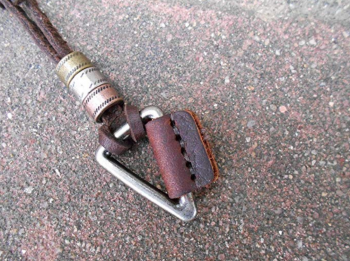 The piece comes with a free 18-inch leather cord that has a lobster clasp attached to it. It was made in the USA to the finest of standards, and you would love it while it sparkles at the v of your shirt. Dimensionally, the pendant measures 1.25 x 1.25 inches to make the pendant fit right into your planned dressing. Take a closer look at the picture of the necklace and admire the versatile looks it will throw on every shade of jewelry you already have. The price is affordable, and you don’t need much persuasion to get one. Other info: the leather cord comes with a 2-inch extension cord. Vintage accessories are always a hit, especially in these seasons. It’s like they say ‘what goes around, comes around.’ Well, the 90s and 80s are coming back again, but now with beautiful design and innovation infused into the production of the necklace. It’s all about the creativity and expertise of the craftsmen and Gyand has a myriad of them with that quality. The leather for this necklace is not made only for the cord; it’s also there in the pendant of the necklace. 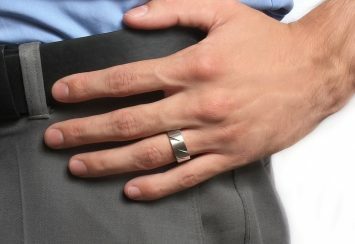 It has a steel triangle that uses a genuine alloy that is nickel and lead-free. Uniquely designed, there is three metal attached to the cord just above the pendant, and they are of different shades that make them look beautiful. The size of the cord is 32 inches, and two cords make it adjustable up to 18 inches. You can get it as the gift and be sure that it would make a very good impression on whoever gets it. There is also a gift bag that you can use to store the necklace and keep it safe from damage or being misplaced. Other info: the leather used for the necklace is 100 % genuine. It has vintage-like materials that are infused with a modern style for that special type of experience. Another great thing about the product is the fact it is suitable for any outing, be it casual dinner or red carpet shows. 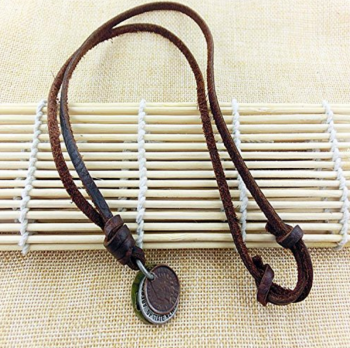 The leather cord that comes with the necklace is 35 inches and was made with cow leather. There are three coins plated to make sure that they don’t fade or tarnish easily. Each of the pendants bares an old inscription and won’t trigger any allergy. The dimension of the pendant is 1.2 x 0.8 inch, which means they are the appropriate sizes to be visible while not being too heavy. We are quite sure that you would enjoy the punk style that goes along with the accessory and it wouldn’t be too long before you aren’t ready to part with the necklace. The price is really great, and the brand is offering a discount on the product to make it even easier to get one. Other info: the color of the pendant is coffee, and there are three of them in each necklace. At our number five is a special piece of jewelry that holds a symbol which means a lot of things to different people. The anchor has always been an interesting item. Throughout history, it has symbolized strength, stability, and resilience. That is the shape of the pendant for this leather necklace, and it is crafted so well that the charm cannot be understated. It will fit any item in your dresser with just your casual self. 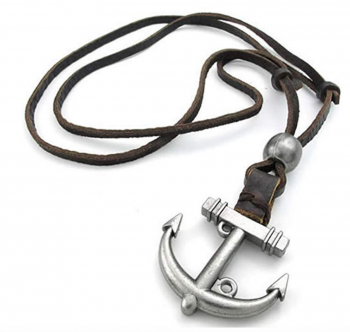 The metal anchor is crafted with a quality metal alloy that is attached to genuine leather. It has a brown silver color that looks shiny and amazing when it catches the light. You can adjust the 24-inch leather so that it fits your neck perfectly. The pendant also has hypoallergenic properties, its tarnish free and requires minimal maintenance. So many features make this piece perfect for our number five spot, and it’s waiting to compliment your wardrobe with its sleek and contemporary outlook. You would be enjoying this piece for a very long time, and the price is just right for your budget. Other info: the necklace features a pendant dimension of 5.1 x 1.6 x 1.6 inches and has a lobster claw clasp. We still have five more gorgeous leather necklace to go for this article, and you would be impressed by the design used for each one of them. Coolsteelandbeyond is famous for crafting pieces that stay at the top of the jewelry category. You can complement your masculinity using this necklace, and its pendant will give you more than enough reason to choose it. This necklace comes with three different pendants that make each fashion statement. 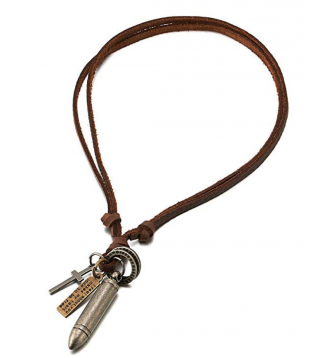 There are a steel bullet, a cross and a metal tag that were all crafted using metal alloy. You might think the necklace would be heavy with all these component, but it only weighs about 36.6 grams. It comes with an adjustable leather cord and can be used by any age category. So you can get it for your husband or your teenage son. All dimension are crafted to perfection to make it fit for just about anyone. For quality that beats price, this is your go-to accessory. You won’t be disappointed in its style. There is no harmful material in the mix, and the leather cord is genuine and brand new. Other info: it is available in two designs which have a different color. Celtic designs are always a beauty to behold, the way they complement any fashion accessory styling them with a vintage image that is highly alluring. Their charm is also irresistible, and when you add that to the string statement that is the ax, you get something that defies all odds. For many, this jewelry would go well to make your day full of awesome complements. 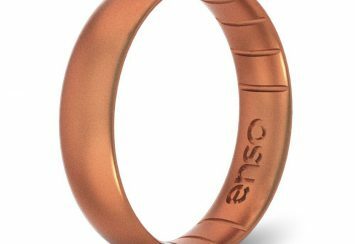 Uniquely designed to meet customer’s satisfaction, the piece is crafted with good quality bronze that is devoid of lead, nickel, and cadmium. The pendant is shaped to look like an ax and has Celt spirals strewn beautiful all around it. Looking at the image, you can already tell that the piece will look wonderful with a nice outfit. For maximum and comfortable fit, there is an extensible slide knot that allows you to change the length of the cord from 32 inches to as tight as 16 inches. 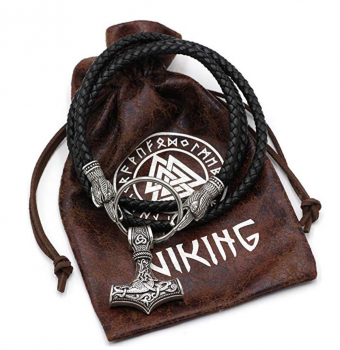 The design of the ax was inspired by Thor’s hammer in Ragnarok, and the leather used to craft the cord is as genuine as they come. You can get the piece for an affordable price, and if you need something that makes a great gift, then this is for you. Other info: the leather is 2 millimeters thick, while the pendant is 1.42 x 0.98 inches in length. At number 8 is a very stunning piece of jewelry. It comes with a cross design that would be very attractive to those that love religious symbols. The cross itself is the pendant, and there is a 100% genuine leather cord used to attach the jewelry around your neck. It is hypoallergenic with stainless steel as the base metal. You would love the feel of the polished surface across your skin. 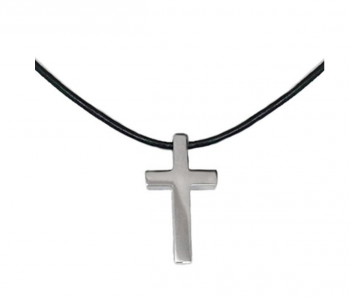 The pendant is quite simple in appearance, and the only shape the stainless steel was carved into is the cross. The dimension is 1.25 by 0.75 making it light and cute looking. The masculinity is not lost in its charm, and the thickness is a sure sign of sturdiness. You can wear it out of the beach, and it won’t be amiss if you also rock it to dinner with your formal shirt. The cord is 20 inches and stays on your neck with the lobster clasp claw at the ends. For Christmas, New Year and any other celebration you can think of. Allow the feel of the metal sink in and inflame your style as you rock it this season. Other info: the leather is black in color and has 2 millimeters of thickness. The best of necklaces use the best quality of materials you can find. That is why this option just had to be in our top ten list. It comes with a base metal that is not only hypoallergenic but is among the most durable stainless steel available. The build is exquisite, and one look at it would convince you to get one for yourself. You might be wondering what material we were talking about when we said the best grade of stainless steel. Well, it’s no other than the 316 L stainless steel. The material is compatible with the human body and doesn’t rust or tarnish for years. 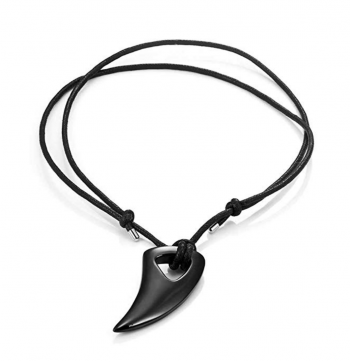 The pendant is coated black and made to look like the tooth of the alpha wolf. It is quite charming, and it comes with a 22-inch leather chain. It has a cool look that isn’t so glamorous but accents your neck perfectly. Urban Jewelry has a group of expert craftsmen that would make sure that the quality of whatever you get from them. The height of the pendant is 2 inches, and it has a width of 0.80 inches. It is not pricey, so you can get one for yourself and another for your loved one. Other info: the piece is resizable to make it fit well. For number 10 on this list, we have a piece of jewelry that has so much swag. It has various beads with different colors complementing each other for a unique blend of aesthetics. The jewelry is suitable for different people and serves as a great gift for any season. The necklace is well designed to make you look good with radiance written all over it. There are different materials used but all of them are authentic and strong. It comes with a layered style, and the first layer is accented with beads and a Celt metal at the center of the piece. For the second layer, there are also colorful beads with a Celt inspired metal at the center with a cross attached to it. The quality of the whole thing is awesome, and we are sure it would look good on you. The tribal design is quite charming, and you get a money back guarantee when you get one. It comes with two different designs so you can either get a tooth on your second layer or a cross. Whichever one you pick will make a great choice for your daily dressing. Other info: the jewelry comes in a well-defined package for easy storage. Among our ranks are some pieces that are so prominent you can’t help but check them out. They stand out with majestic appeal and will accent your outfit with resplendence. You might have some questions about the products listed. We have provided some answers that would help alleviate some of your curiosity. So read through and see if you can find some answer. 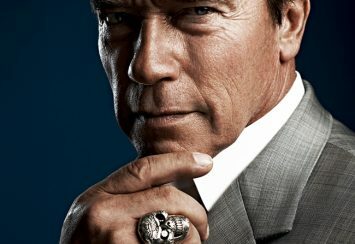 What type of leather is used for the necklaces listed in the article? The leather that would be used for a necklace would have passed through a lot of treatment. Cowhides are mostly used, and they go through processes like tanning before they can be attached to your neck. There is a lot of processes used for this, but you basically need to know that the hide is treated to remove impurities and soften it for tanning liquid. Then, then it’s left in tanning solution for a specific number of days before removing it. You can then split it and modify it to make sure it is fit for aesthetic purpose. What other accessories would go well with the leather necklace? There are a leather bracelet and stud earrings that would go well with your ether necklace. You can get a great outfit that would also go well with the necklace. In fact, there is no accessory or clothing that does not work well with leather necklace. Just be moderate, and you are good to go. How do I care for my leather necklace? Taking care of a leather jewelry piece is quite different from the way you take care of other necklaces. For a leather necklace, the longevity depends on how well you keep it safe. ✓ For starters, avoid exposing the leather to harsh weather condition or chemical. ✓ When you want to clean it, just oat it down with a damp cloth. Don’t use too much water and avoid immersing it into any solution. ✓ You can use a small dab of mild, moisturizing hand soap or get a leather cleaner for proper cleaning.